2.34mm – rimfire round used in MTH‘s Swiss Mini Gun. 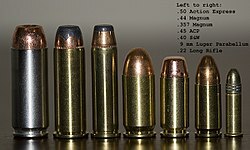 From left to right: .50 Action Express, .44 Magnum, .357 Magnum, .45 ACP, .40 S&W, 9 mm Luger Parabellum, .22 Long Rifle. All text is available under the terms of the NU Free Documentation License.